WHAT HAPPENS AT A TYPICAL SHOW? Our shows consist of multiple games. The competition format varies. Some games are head-to-head, some involve teams, and some have the entire audience competing against one other. The timeframe of your event will determine how many games we play, and your purpose for the event will determine which particular games are played. At an hour-long event we usually play around five games. Shows can last as long as you need, but most shows last 60 to 75 minutes. In addition, we receive a number of requests for customized training, such as new employee orientation. Our format perfectly lends itself to teach or reinforce important information. We can also serve as your conference hosts. Not only can we handle all your housekeeping announcements, we can engage the crowd with some high-energy games and prizes to get them ready for your next general session. While we are not associated with programs you may have seen on television, some popular TV game shows have inspired some of the games we’ve created to work for live audiences. The games themselves are run via laptop, with a tech person and live host working in conjunction. The software for all of our games is made in-house. You won’t see our games anywhere else. Our staff has a combined background of entertainment, software development, and corporate training. Over the years, we have refined our knowledge of what works and engages audiences, so we know exactly what we want and how to make it. All of our graphics are top quality and the music and sounds for each have been created specifically for each game. The following graphics represents some of the more popular games we play. Select any of them for more details. 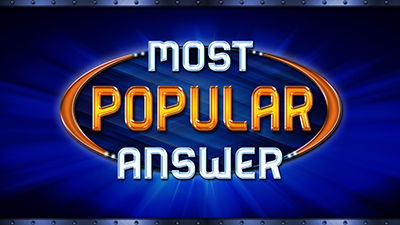 Most Popular Answer is inspired by the TV show Family Feud, with our own variations (including original music, graphics and rules). Teams battle to try and come up with the top answers to fun questions. 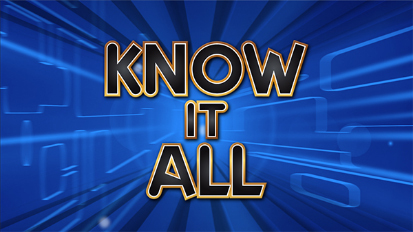 Know It All is inspired by the TV show JEOPARDY!, with our own variations (including original music, graphics, and rules). For instance, each of the four “Player” positions can be manned by up to three people, so a total of 12 can play at once. 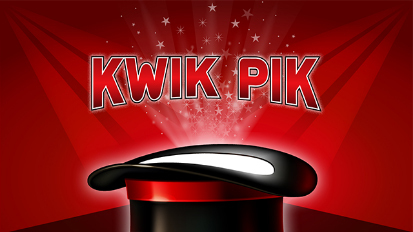 Everyone pays close attention during Kwik Pik. The computer randomly selects from a pre-populated list. It’s perfect for giving away prizes during a raffle or otherwise. In The Answer Is…, two people compete head-to-head. 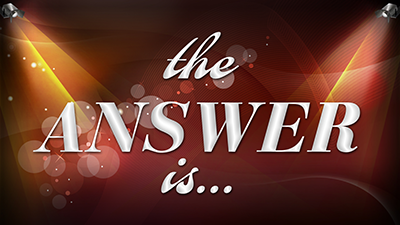 We reveal three possible answers first, and then the question. The first person to buzz in gets to guess. Circle of Trust is inspired by the game Pyramid, with our own variations (including original music, graphics and rules). Two people are on a team, but only one can see the screen. It is that person’s job to describe a word that appears to his or her teammate. They guess as many words as possible while the clock is ticking. Order Up has four teams of 2, 3, or 4 people (it’s flexible). You can have fewer teams if desired. Teams are shown four items and then asked to put them in a certain order. Teams have 25 seconds to talk about it. For each item that a team gets in the correct position, 100 points is awarded. Face Off is for the entire audience. We ask a question, and the correct answer is either on the left side of the screen or on the right. Each person in the audience casts their vote by turning to the left or to the right. After five seconds, we reveal the answer. Everyone facing the correct direction remains in the game, while everyone else has a seat. We continue until the winner(s) is left standing. The Big Picture is inspired by the popular matching game of Concentration. Pick two tiles that match each other and they disappear, partially revealing a “big picture” behind them. In this game, we work the crowd by moving around the room and asking random people to give it their best shot. 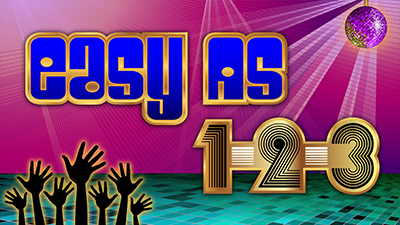 Easy As 1-2-3 involves everyone. First of all, everyone in the audience picks a teammate (and it’s okay if teams end up with three people). We ask a question, and the correct answer is always 1, 2, or 3. Teams hold up the number of hands they think corresponds to the correct answer. After 7 seconds we reveal the answer and teams that are right stay in the game. Drop it Like it’s Hot has four teams of 2, 3, or 4 people (it’s flexible). Teams are shown a multiple choice question and have 15 seconds to talk about it. They are then allotted a fixed amount of points they can wager on each answer. One-by-one incorrect answers drop off the screen along with any points they had wagered on that answer. WHO COMES TO AN EVENT FROM THE BIG GAME SHOW? We provide you a host and a technical operator. For equipment, we bring our own Windows laptop for the games. We also provide a buzzer system and stage décor, as needed. For shows under 200 people and within driving distance to Atlanta, we can provide all other A/V equipment as well, including sound system, podium(s), projector, and large screen(s). At very large events or events that require flying, we bring our laptop, buzzer system, and some stage décor. We then tap into an existing A/V system. Just tell us where you need us and we’ll be there! New York, Hawaii, Bahamas, and yes, any town in the middle of nowhere: we've been there and love the experience. We fly to about 20% of our events. For another 30%, we make a long road trip and spend the night. About half of our events are in areas surrounding Atlanta. If we are required to fly, we ask you to cover the cost of flights and hotel. We typically cover the cost of our own ground transportation and any other expenses traveling to and from your event. As far as what we can control, there’s no way we will embarrass any of your guests. We love seeing people win, laugh, and we want to have fun alongside them. We offer lots of encouragement, we don’t talk in fake game show voices, and we strive to make your people feel comfortable so they can enjoy playing the games. If a contestant says something absolutely ridiculous and the audience laughs their heads off, we may offer a gentle ribbing in the flow of the game, but we always do it with grace and let your guests know we’re on their side. How much time in advance should we book The Big Game Show? We ask for a three-week minimum, but we know sometimes you might need a quick turnaround, so feel free to reach out even if it’s a tight deadline. People typically book 30 to 90 days out, though some book a full 12 to 18 months in advance. In short, we can work with whatever the situation calls for. There are a number of us who host The Big Game Show, so there is an excellent chance we can make your event work. What is the process leading up to an event? Pick the games and order that will work best for you. Determine how much of the show needs to be customized versus pop culture trivia. Determine the A/V and technical needs. Treat your people like a million bucks. Can I get pricing information? We’re not shy about our information, but we know that sometimes you need a nicely formatted version of it to show in meetings. Just let us know where to send it, and you will automatically receive a professional-looking PDF with our pricing structure. To get your pricing PDF or if you have any additional questions, Contact Us.